Eggs Motul Style Recipe | Mexican Recipes, Quick and Easy. Let me tell you about the first time I saw Huevos Motuleños. It was at a small restaurant in Villahermosa, Tabasco, on a warm Saturday morning around 10:00 AM. By that time, I was really hungry and ordered some scrambled eggs and my then-boyfriend ordered Eggs Motul Style. I had no idea what Motul meant. He just said, “Wait and you will see”. When the server arrived with the dish, the first thing that crossed my mind was: “What, no Molcajete?” There was so much tasty stuff on it, that I thought that it was only missing a Molcajete. Little did I know that this dish would become my family’s favorite traditional birthday brunch. Yes, brunch. See, a couple of years ago we started this tradition of bringing breakfast in bed to the member of the family celebrating their birthday. It used to be a light breakfast, something like coffee, orange juice, and toast with butter. But somehow throughout the years, things got escalated to the point that one year my son told me that he wanted to have Huevos Motuleños for his birthday breakfast in bed. This is when we decided to drop the breakfast line and change it to brunch. Imaging having eggs in bed, with a side of plantains and all the garnishes that go on the dish. But this is still the favorite of my two guys at home, a very manly dish. 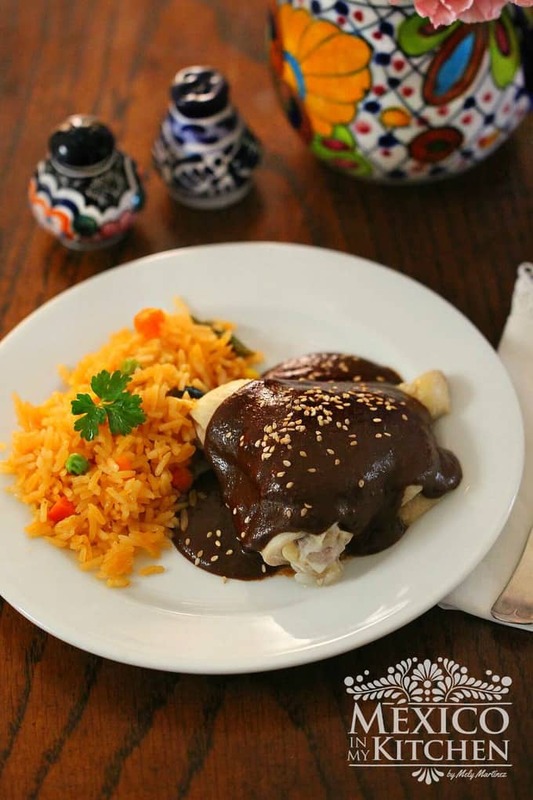 This recipe is based on the Traditional eggs made in the picturesque small town of Motul in the State of Yucatán. The eggs at the local market in Motul are served on top of a corn tortilla spread with refried beans and then topped with another tortilla and tomato sauce. It is commonly served in the State of Yucatán and the neighboring States like Quintana Roo, Campeche, Tabasco, and Oaxaca with the ham, cheese, peas and fried plantains. * Day old tortillas absorb less oil and take less time to fry. ** If the red onion is not available, use white onion. *** You can use any other dry crumbling cheese. ****If you are making more than 2 servings, turn your oven at 250 to keep the already cooked eggs warm while you finish cooking the rest of the eggs. In a skillet over medium-high heat, warm one teaspoon of oil and add the onion and habanero pepper (whole). Fry until onion is transparent, making sure the Habanero pepper doesn’t burst. The Habanero pepper will render its flavor to the sauce this way without adding spiciness. Add the diced tomatoes and cook for about 7 minutes until the tomatoes have released all their juices and formed a thick sauce. Season with salt and set aside. 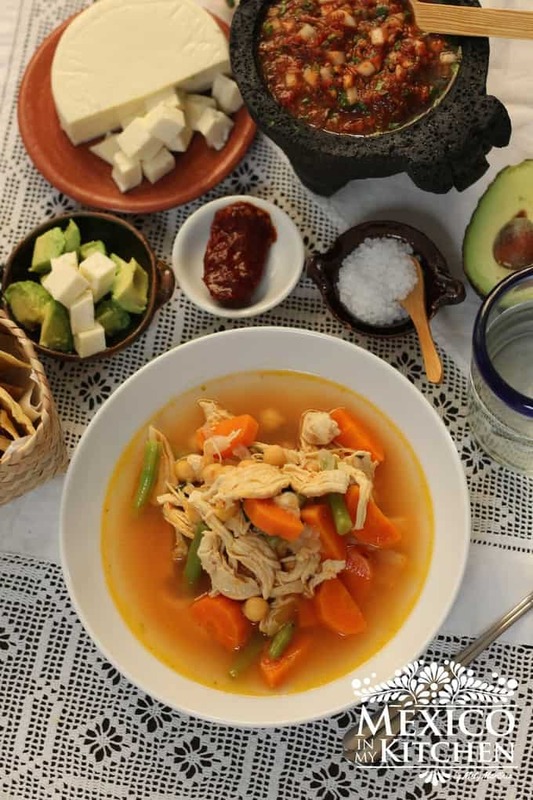 Start gathering all your ingredients to assemble the dish and have them ready for serving once the eggs and tortillas are fried. Heat the rest of the oil in the frying pan and start frying the tortillas one by one. Fry the tortillas until they are a little crispy, this way they will hold the egg and sauce without breaking into pieces. Place each tortilla over a paper towel to drain any excess oil. Once all your tortillas had been fried, arrange 2 on each plate and spread the refried beans over the tortillas. In the same skillet where you fried the tortillas start frying the eggs, you can cook them over easy or sunny side up, that will be your personal choice. Place an egg over each tortilla. When all the eggs are cooked, cover them with the tomato sauce, leaving the egg yolk to uncover if you wish. 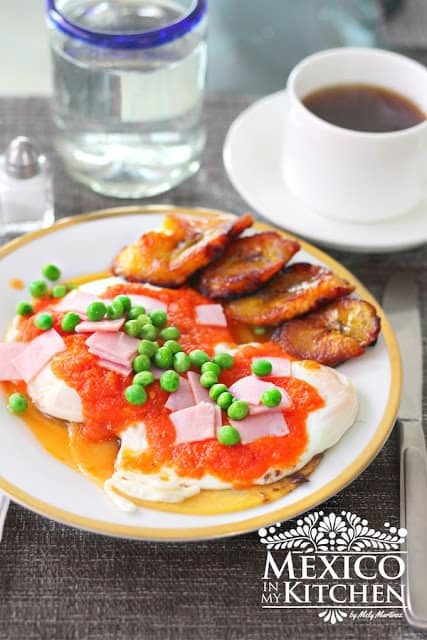 Garnish with the ham, peas, cheese and fried plantains. Serve warm. Eggs Motul Style, This recipe is based on the Traditional eggs made in the picturesque small town of Motul in the State of Yucatán. The eggs at the local market in Motul are served on top of a corn tortilla spread with refried beans and then topped with another tortilla and tomato sauce. 1 plantain cut in diagonal slices and fried. In a skillet at medium-high heat, warm one teaspoon of oil and add the onion and habanero pepper (whole). Fry until onion is transparent, making sure the Habanero pepper doesn’t burst. The Habanero pepper will render its flavor to the sauce this way without adding spiciness. In the same skillet where you fried the tortillas start frying the eggs, you can cook them over easy or sunny side up, that will be your personal choice. Place an egg over each tortilla. When all the eggs are cooked, cover them with the tomato sauce, leaving the egg yolk uncover if you wish. Garnish with the ham, peas, cheese and fried plantains. Serve warm. Receta en español Huevos Motuleños. Mely, theses eggs look very yummy! I'm in Puerto Rico right now and I've been eating a lot of palatines. I never liked them in Mexican food but now, I will go home and transform the mangu and tostones into a mexicanized dish – just because I miss my salsa. The first thing I'll make when I get back will be your recipe! Take care. What a nice tradition to start for the birthdays! These are full of yumminess!! It is a yumminess heaven! Después de una larga ausencia, pasando a saludar amiga, ya regresé! Que gusto saber que estar de regreso, pasare a visitarte. Oh my goodness! These look delicious. I cannot wait to try them! Thank you for sharing this recipe.